Some coins were arranged in a row. Half of them were tails up. Two of the coins are turned over and now one third of them are tails up. How many coins were in the row? Teacher: Here is a visual aid to use if required. Coins can be dragged and, to turn them over, doubleclick. I have used your starters for 3 years now and would not have a lesson without one! Fantastic way to engage the pupils at the start of a lesson. Some of us caught on quickly. But majority found it tricky. Drawing coins helped to explain the answer. You should have been more specific with the wording and said that the tails were turned over. The wording of the question is fine. If 1/2 of the coins start as tails up, and, when 2 are turned this becomes 1/3, it should be obvious that it was tails that were turned because 1/3 is less than 1/2. If you started with 6 coins and turned one head and one tail over, you would get to 1/2 and 1/3. The rest of the class were most impressed! 3x - 2x = 12 so x=12. One child in our class found this particularly confusing but she eventually understood after much discussion and debate with the teacher! Everybody else found it interesting, if not challenging. Challenging for average grade 5s, although very easy for my intelligent brain and my quick way of using Trial and Error. =). This starter has scored a mean of 3.0 out of 5 based on 481 votes. There were 12 coins on the table. An alternative way of arriving at the solution to this problem is to use the fraction wall to see that the difference between a half and a third is a sixth. So a sixth of the coins on the table is 2. 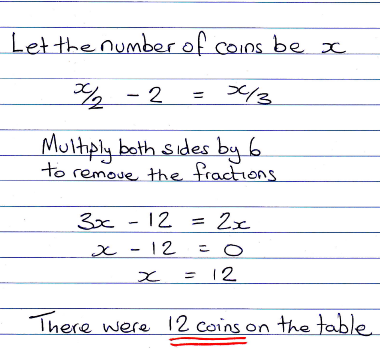 Therfore the number of coins on the table is 6 x 2 = 12. Do you think a fraction wall might help with this puzzle?